***PRICE JUST REDUCED *** Enjoy this Beautiful Home in the Laguna Lake Mobile Estates with Fabulous Views of the Surrounding Hills! 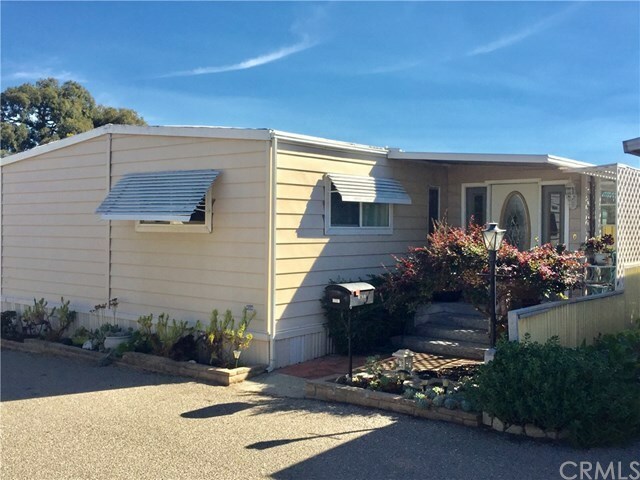 This Home is Light and Bright with Plenty of Natural Light and Includes 2 Bedrooms, 2 Baths, Living Room, Dining Room, Bonus Room, Enclosed Patio, and Inside Laundry. Enjoy the Peaceful Private Patio and Seating Area. Patio is Enclosed for Pets. This Home Sits Higher in the Park Offering Great Views! Low Maintenance Landscape and Yard. Central Air Conditioning, New Floors, New Sliding Doors, New Windows in Master Bedroom and Bath, 3 Storage Sheds, Updated Electrical System, Recently Resealed Roof, Gutter System, Irrigation System, and 2 Car Carport. Park Approval Required. Park has RV STORAGE. PARK AMENITIES INCLUDE: Pool, Spa, Gym, Recreation Room, Library, and Community Kitchen. NO TAXES: The Last 2 Years Registration Fees were $75.00/year. SPACE RENT: $743.88/month to new owner per park manager. Space Rent Includes Water, Sewer, Trash. Call Your Realtor Today! Seller is Motivated! Directions: Los Osos Valley Road to Perfumo Road, Left on Kerry then Right on Garnette Drive. Inclusions: Refrigerator, washer, and dryer.